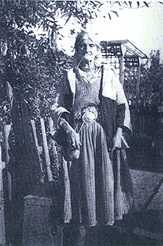 The Ludar, or "Romanian Gypsies," also immigrated to the United States during the great immigration from southern and eastern Europe between 1880 and 1914. Most of the Ludar came from northwestern Bosnia. Upon their arrival in the United States they specialized as animal trainers and showpeople, and indeed passenger manifests show bears and monkeys as a major part of their baggage. Most of de Wendler-Funaro's photographs of this group were taken in Maspeth, a section of the borough of Queens in New York City, where the Ludar created a "village" of homemade shacks that existed from about 1925 to 1939, when it was razed. A similar settlement stood in the Chicago suburbs during the same period. Anyone with information on Ludar in America please contact us.